As shorter turnaround times and intelligent assets become bigger priorities for oil and gas operations, EPC professionals are looking to more modularized, automated facilities—including portable units that can house sensitive equipment, monitor processes, plus satisfy crews and personnel. Shipping containers can become ideal vessels for the industrial switchgears needed to control and protect large motors in a facility with motor-operated valves, compressors, pumps, etc. Containers are easy to modify with HVAC and fire-suppression systems. Climate-controlled units can also feature specialized ports for incoming and outgoing power lines. Using shipping containers for MCC purposes helps companies achieve a smaller footprint, while protecting essential technology inside. Containers can be outfitted with leading-edge insulation and custom security features to prevent unauthorized access. They are exceptionally easy to transport, and they can be engineered to house just about any kind of technical equipment from your chosen manufacturers. Shipping containers offer innovative solutions for gas compression stations, or booster stations, too. Because they’re so easy to deliver and deploy (requiring only a firm, flat surface for installation) containers are a growing material choice for out-of-view air compressor shelters (buildings used to enable clean-burning flares at an oil gathering, storage or processing facility). Depending on your needs, compression station equipment could be housed in a 20-foot or 40-foot standard shipping container. Again, container units are easy to outfit with the necessary components—in this case: fire-safe heaters/thermal screens, emergency lighting, forced and exhaust ventilation, and fire prevention systems. Our engineering team understands the requirements for fresh air supply as well as axial-flow fans to keep compressor equipment from overheating. Oilfield production sites require safe, durable housing units for employees. Rapid deployment and cost efficiency are always top priorities, but in the energy sector, the ability to dismantle and relocate valuable assets bears equal weight. Shipping container housing for today’s man camps ticks all the boxes above. Container housing stands up against severe weather, and is easy to maintain/reuse in different locations. Offshore living quarters create challenges of their own. Frequently, companies need to integrate additional living space into existing rigs or transport vessels. This requires an advanced understanding of marine structures and regulatory provisions (e.g. U.S. Coast Guard requirements). Our team has experience designing and delivering offshore assets—including helidecks and portable living quarters—with Corten steel shipping containers. Find out what else shipping containers can do to support a broad range of energy sector projects (engineering, procurement, construction management). 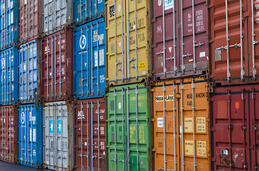 Our contact us directly, to learn more about the features and benefits our modified shipping containers provide.